This is a great example of a make ahead meal and/or freezer meal. I see spice mixes as a way to flavor various meats with very little effort. All I did was combine extra virgin olive oil, lemon juice, Herbes de Provence spice mix, salt, pepper and minced garlic in a bowl to create a marinade. The chicken is then tossed in the marinade and set aside at room temperature to absorb the flavors. You can freeze at this point and when you're ready to prepare, allow the seasoned chicken to defrost. Once defrosted you can cook the seasoned chicken on a grill, or bake/roast it in the oven until cooked through. This method of using spices is one I apply to many kinds of meats and spice mixtures. Feel free to try it with whatever spice mixes you have lurking in your cupboard along with your favorite cuts of chicken, pork, beef and even seafood! 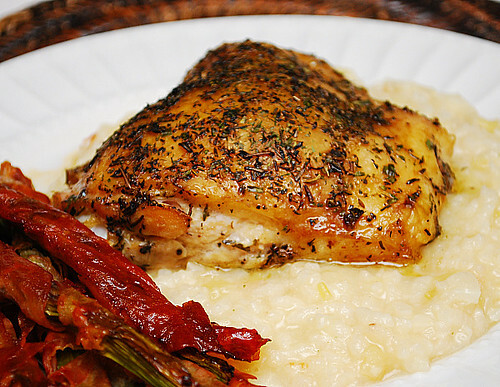 I served this flavorful chicken with a Leek Risotto (recipe follows) and prosciutto wrapped asparagus. Whisk the olive oil, spice mix, lemon juice in a bowl to create a marinade. 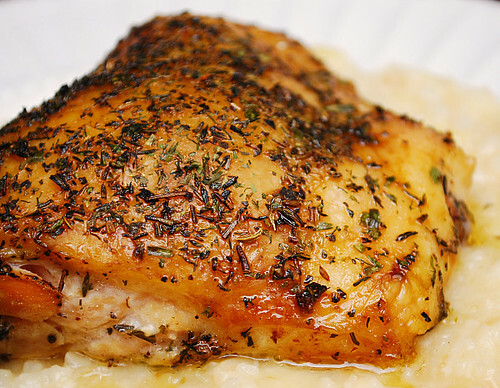 Place chicken in a baking dish and pour the marinade over the chicken and toss to coat. Allow it to sit at room temperature for at least 10-15 minutes for flavors to absorb. Pour the stock or broth into a saucepan and bring to a simmer. Keep liquid hot while cooking risotto. In a large, heavy saucepan over low heat, heat oil. Add the leeks and minced garlic, saute about 5 minutes until fragrant. Add the rice and stir until slightly toasted, about 1-2 minutes. Add the wine and stir until absorbed, about 2 minutes. Add one ladleful of the hot stock or broth, adjust the heat to maintain a gentle simmer, and cook, stirring constantly, until the liquid is absorbed, about 2 minutes. Continue adding the stock or broth, one ladleful at a time and stirring constantly, until the rice is just tender but slightly firm in the center and the mixture is creamy, 20-25 minutes longer. Remove from heat and add the cheese; season with salt and pepper to taste. That looks so delicious; I just might have to change my menu for tonight! This looks so good and am right in the middle of making this and got a little bit confused. In the writing part it mentioned "minced garlic" but in the recipe directions no mention. So garlic or no garlic? At this point I guess garlic because I love the flavor of garlic and lemon together. Lovin' your recipes and knowledge of making them freezer meals. This is helping so much! My husband is really the guy to thank for this. He'll take any frozen pizza & simply mince up some garlic, anchovies with capers (1 or 2), any cheese, and a generous sprinkling of herbes de Provence & sprinkle it over the whole pizza. We've had friends ask for our secret pizza recipe & the like, only to admit that it was a Costco Take & Bake with the "secret sauce" added. Hello, I havn't seen Herbs de Provence in WA could someone please tell me which herbs are included. 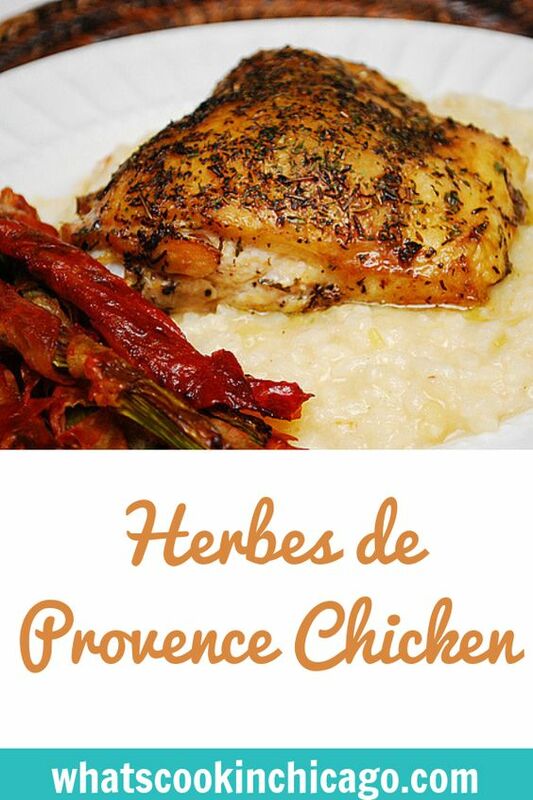 You can find the recipe for HERBES DE PROVENCE on the food network website under EMERIL LAGASSE. To that recipe, just add 1 to 2 TBSP of dried lavender. Or you can buy the mix online.